"Land Your Dream Here"Â© Located only 19 mi from the Hamptons across LI Sound, set on 3.89 acres with over 2,500 feet of water frontage. This elegant Georgian Manor Estate was built in 2004, to hurricane standards by one of Fairfield Countyâs finest builders and features expansive views of Long Island Sound enjoyed from virtually every room, an open floor plan, sweeping stairway, crown moldings, brass hardware, antique fireplace mantels and mahogany doors. This spectacular 14-room home offers more than 7,400 square feet of luxurious living space with five bedrooms, seven full bathrooms and one-half bathroom. Other highlights include a spacious kitchen with floor to ceiling windows enjoying views of Long Island Sound. French doors lead to a wrap-around bluestone patio. Master bedroom suite features access to large second floor balcony with panoramic views, fireplace, his and hers bathrooms and dressing rooms. Additional features include five fireplaces; five outdoor balconies; an elevator; lower level with safe room, large storage area, protected dock, mooring, and a two-car garage with upper level guest quarters. This self-sustaining property has its own generator, water and mechanicals to be totally off the grid if needed. 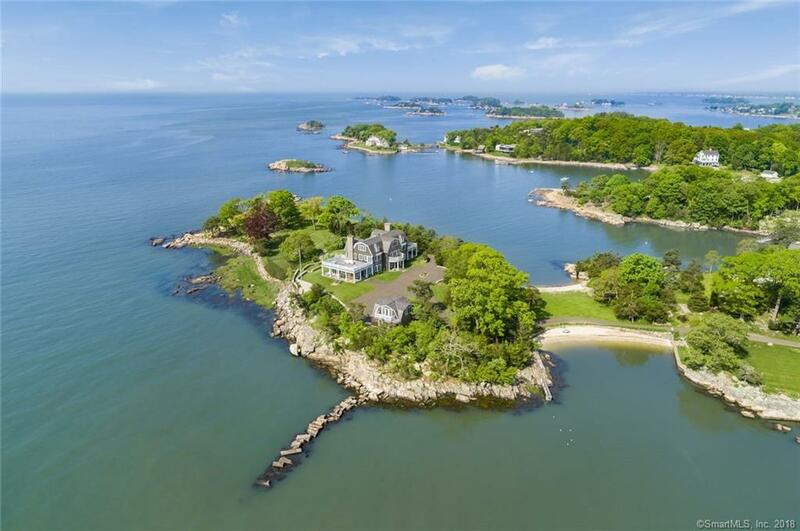 This property is one of the finest waterfront locations along the CT Shoreline. Room for pool, gardens, and helipad. Southwest See FEATURES attachment for more details. 75 miles NYC. BY APPOINTMENT ONLY â NO DRIVE BYS. View Virtual Tour, Guest bedroom fireplace mantle not included in sale of property.